Barnyardgrass (Echinochloa crus-galli var. crus-galli) is a monocot weed in the Poaceae family. In Italy this weed first evolved multiple resistance (to 2 herbicide sites of action) in 2009 and infests Rice. Multiple resistance has evolved to herbicides in the Groups A/1, and B/2. These particular biotypes are known to have resistance to azimsulfuron, bispyribac-sodium, cyhalofop-butyl, imazamox, penoxsulam, and profoxydim and they may be cross-resistant to other herbicides in the Groups A/1, and B/2. For the genus Echinochloa it is often very tricky to give a species for a certain population because they are often a mix of species, and plants can also be phenotypically intermediate. The resistance mechanism for ALS-inhibiting herbicides is related to an altered target site, whereas for ACCase-inhibiting herbicides the mechanism is unknown. 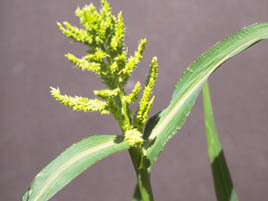 Field, and Greenhouse trials comparing a known susceptible Barnyardgrass biotype with this Barnyardgrass biotype have been used to confirm resistance. For further information on the tests conducted please contact the local weed scientists that provided this information. There is no record of differences in fitness or competitiveness of these resistant biotypes when compared to that of normal susceptible biotypes. If you have any information pertaining to the fitness of multiple resistant Barnyardgrass from Italy please update the database. The Herbicide Resistance Action Committee, The Weed Science Society of America, and weed scientists in Italy have been instrumental in providing you this information. Particular thanks is given to Silvia Panozzo, and Maurizio Sattin for providing detailed information.